A header from substitute Derek Lyle mid-way through the second half was enough to earn Queens a place in the draw for the 4th round of the Scottish Cup, as the home side rather fortunately claimed a win over Championship rivals, Hamilton Accies, at a windswept and rain soaked Palmerston Park this afternoon. After what can only be described as a pretty non inspiring first 45 minutes, the 2nd half did at least provide the crowd of 1324 with some entertainment, and although Queens ran out eventual winners, they were certainly helped as they enjoyed plenty of good fortune, as well as producing some resolute defending when the visitors threatened. 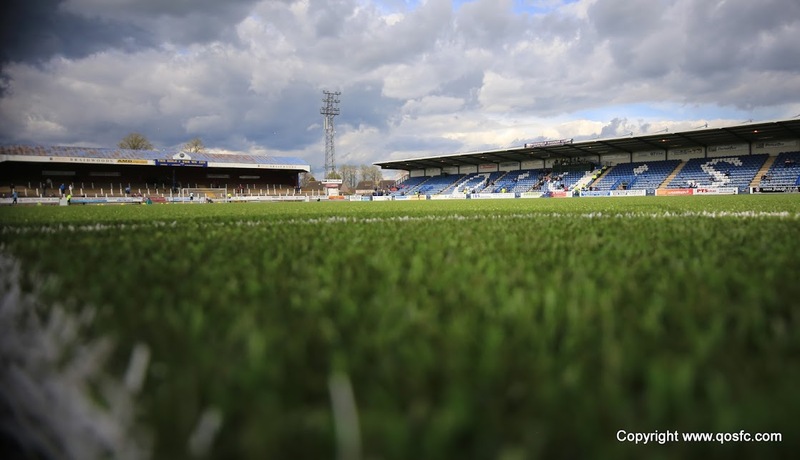 For the second game in a row, Queens were able to name the same starting line-up, as on- loan St. Johnstone `keeper, Zander Clark was given permission by his club to play, with the big shot stopper making his home debut. Although league games over the years between the teams have been common place, Scottish Cup games between the two have been limited, with the teams having clashed on just 5 occasions since they first met in the 2nd round of the 1924 competition. 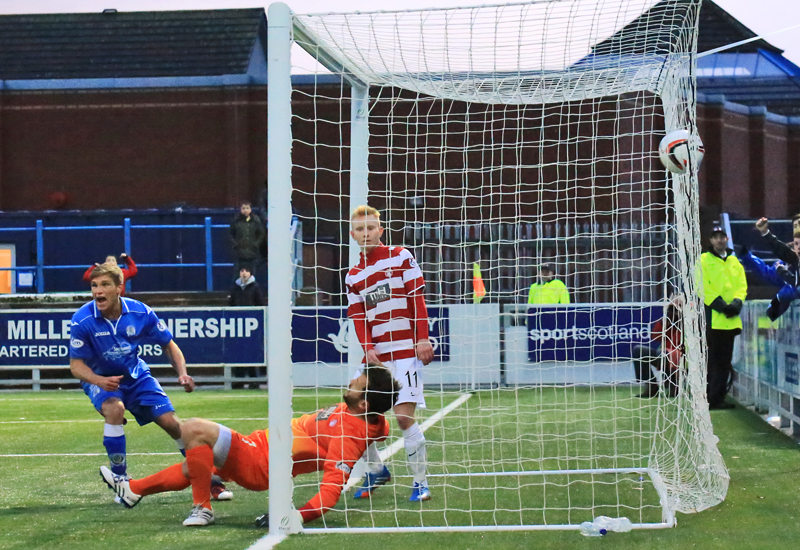 The most recent of those Scottish Cup games came in January 2006, when it was the Accies who progressed with a single goal replay victory after the teams shared a 1-1 draw at Palmerston. The record books show that Queens` only Scottish Cup win over Hamilton was a 3-0 home win back in March 1963, and Queens went into the game hoping for a similar outcome.. Visitors Hamilton Accies excellent start to the season continued last weekend as they recorded their 9th win from 15 games in all competitions, as a comfortable 2-0 victory Falkirk over kept them at the top of the Championship table. Earlier in the season, Queens suffered a reversal in a 2-0 league defeat at New Douglas Park, where so far, only St.Johnstone- in a league cup tie-have beaten the Championship`s leading team. Leading scorer, James Keatings, and player-manager, Alex Neil, were both injured absentees. With a blustery wind swirling all around, and rain falling for most of the 90 minutes, it was clear from the start that the weather conditions would have a major influence on the game and in the opening spell both teams seemed to be struggling with the conditions as neither team were able to pass the ball comfortably, and players from both sides were constantly losing their footing. In what was a very mediocre start to the game, it was the visitors who seemed to be adjusting slightly better to the conditions as they created a couple of half chances, but headers from Jon McShane after 6 minutes, and then again after 13 minutes were always going wide of the target, although to be fair, his 2nd effort was a lot nearer than his first was. Queens were struggling to find any cohesion to their game, and although Kevin Dzierzawski was seeing plenty of the ball, his usual range of passing was somewhat stifled by a combination of the windy conditions, and the visitors tight marking all of which prevented Queens from finding space to attack down either wing. On 18 minutes Queens were awarded a free-kick after Kevin Holt was fouled, and although Chris Mitchell`s cross reached the head of Mark Durnan at the far post, the big defender was penalised for a foul, and any advantage that Queens had gained ended with a free-kick being given to the visitors. Minutes later, Queens were awarded another free-kick in a much more promising position after Iain Russell`s lively burst down the left saw his progress halted by Gordon just outside the box. Once again Mitchell delivered to the back post where Gavin Reilly, after spinning clear of his marker, was just unable to make full contact with the ball, and his effort sliced well wide of the target. With the visitors slowly starting to have more possession, a quick break by Crawford down their left almost saw the wide man find McShane in the penalty area, but his pass was superbly defended by Durnan who came across to block the cross away for a corner. Although Queens coped with the resulting set-piece pretty comfortably, when Hamilton regained possession moments later, the Championship`s leading side almost took the lead. Collecting the ball just inside the Queens half, Darian MacKinnon moved forward unchallenged until he reached the edge of the penalty area, whereupon he hit a low drive that flew just wide of Zander Clark`s right hand upright. It was the closest that either side had come to breaking the deadlock, and thankfully for the majority of the fans inside the ground, the ball finished the right side of the post. As an attacking force, Queens had shown very little, and with lone striker Reilly being isolated for most of the half, the home side really struggled to find any rhythm, and as such creating chances was proving to be very difficult. The pace of Reilly seemed to be their best chance of finding a way through the well organised Accies defence, and indeed after 38 minutes it was the youngster who almost carved out an opening. After challenging for, and winning the ball just inside the Hamilton half, Reilly then showed tremendous pace to latch on to a Derek Young pass in behind the visitors defence, but unfortunately he was too quick for his colleagues and after getting clear of the chasing defender, his cross into the box eluded everyone and was eventually cleared. With 3 minutes of the half remaining, Queens finally managed to have a shot at goal, but Iain Russell`s effort from 25 yards out rather summed up Queens first half display, as his wild strike landed on the Terregles Street terracing. On the stroke of half-time, Queens had a major let off. With the ball bouncing around just outside the Queens penalty area, Accies` midfielder Crawford showed good skill to bring the ball under his control before he produced a clever dipping half volley that crashed off the underside of the crossbar with Clark well beaten, and although Andreu reacted quickly to steer the rebound into the net from close range, he was clearly offside as he did so, and the goal was correctly ruled out to leave the teams all square at the interval. The second period began with the visitors dominating the early stages, and after producing a flurry of early corners which Queens did well to defend, on 52 minutes, the visitors should really have broken the deadlock. A through ball down the middle of the Queens defence saw both Higgins and Holt converge on the ball, and as the two met, Accies striker Brophy squeezed between them to take the ball and go one-on- one against Clark, but as the Queens `keeper came to meet him the striker placed his shot wide of the target as once again Queens rode their luck. With Hamilton controlling the midfield , Queens were looking as though they were getting over run in that area, and on 57 minutes,they made their first change of the game. Ian McShane was replaced by Derek Lyle and the formation also changed as Lyle was pushed upfront alongside Reilly as the Queens boss switched his team to a 4-4-2 set-up. Just short of the hour mark, Queens on loan `keeper Clark reacted well to tip over a header from McShane following a corner, and as the game started to become a bit stretched, Queens began to enjoy more of the ball in more advanced areas. The introduction of Lyle and the switch of formation was also paying off, and after being awarded a free-kick on the left, Queens at last forced visiting `keeper Cuthbert into making a save as Mitchell`s angled shot from the set-piece was pushed away by the visitors shot stopper. This period of the game was certainly the best for Queens, and after a spell of sustained attacking which had the visitors showing some signs of frailty at the back, and following the second of two corners in quick succession, Queens took the lead. After Mitchell`s delivery from the left was cleared for another corner, this time from the other side, Mitchell once again delivered a quality ball into the near post area where Derek Lyle pounced to head home his 7th cup goal of the season, and his 10th overall to give Queens a slightly undeserved lead. Although Queens were in front, it was still Hamilton who appeared to carry the greater threat as they pushed for an equaliser, but when they did get in behind the Queens defence, either Mark Durnan or Chris Higgins, and sometimes both, were well placed to see off any danger. With the clock ticking towards full-time, Hamilton threw plenty of high balls into the Queens box, but skipper, Higgins who was brilliant all afternoon, marshalled his defence well, and to be fair, there were not too many `scary` moments for the Queens fans to witness. With 6 minutes left the tiring Gavin Reilly, who had run himself `into the ground`, was replaced by Michael Paton as the home side looked to run down the final few minutes. Hamilton substitute Antoine-Curier worked an opening for himself, but his shot was always rising, and in the final minute of added on time with `keeper Cuthbert joining the attack for a corner, the visitors last chance came and went in the blink of an eye as a left wing corner flew past everyone and away from danger. So it was Queens who booked themselves a place in the next round, and in doing so, recorded only their 2nd ever Scottish Cup win over Hamilton. Queens` captain Chris Higgins got the man-of-the-match award, and after the narrow victory, everyone connected with Queens will look forward to the outcome of Tuesday`s 4th round draw. 3 min Queens line up 4-2-3-1 with Reilly up front supported by Russell on the left, Carmichael on the right and McShane through the centre. 5 min Hamilton have the first effort on goal as Jon McShane heads over from the penalty spot. No problem for Clark. 9 min Queens are yet to get a hold of the ball in any meaningful positions with Hamilton enjoying a better start to the game without threatening. 13 min Best chance of the match so far as Hamilton`s Crawford swings the ball in for Jon McShane to head just wide of the far post. 16 min ...The kick is aimed at Mark Durnan coming in at the back post but the big centre back fouls his man and Hamilton survive. 20 min Queens come close as Mitchell plays in a free-kick from the left and Reilly miscues wide. Straight from the training ground that one. 25 min Great defending from Durnan as Hamilton attack down the left flank. Crawford plays a low cross toward McShane but Durnan got their first. 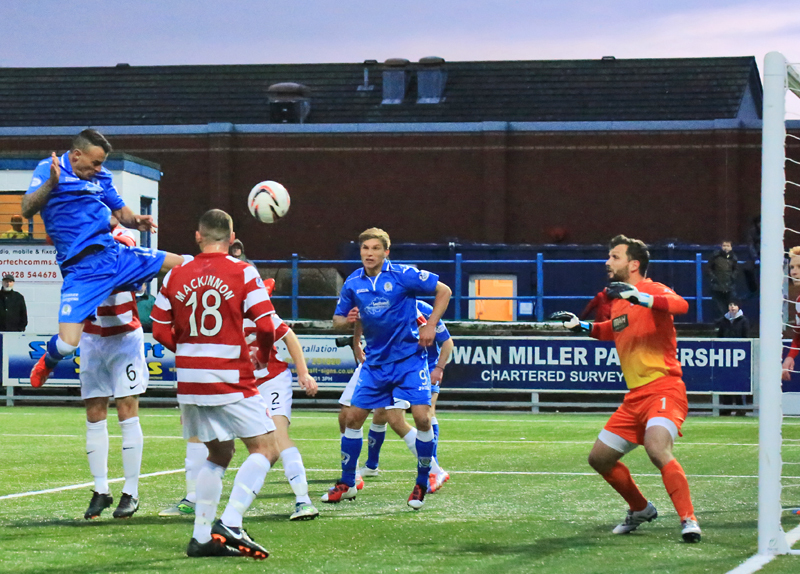 26 min Hamilton threaten again as Darian MacKinnon fires a shot a yard wide of Zander Clark`s right-hand post. Queens yet to get started. 37 min Excellent play from Reilly as he grabs a loose ball and is then played in behind. He cuts inside his defender and crosses but no-one there. 42 min And at last the first shot from a Queens player. It`s Iain Russell who has the pop from 25 yards but puts it into Terregles Street. Half Time Very poor first half from Queens as they have really struggled to make any headway against the Hamilton defence. Improvement needed. Half Time The teams are out and ready for the second half. Hopefully we`ll see a big improvement from the home side. 50 min No changes from either side as Hamilton continue where they left off. Queens are having to defend plenty of corners at the moment. 51 min Huge chance for Hamilton as Brophy squeezes between Higgins and Holt to go one-on-one with Clark but he drags the shot wide of the far post. 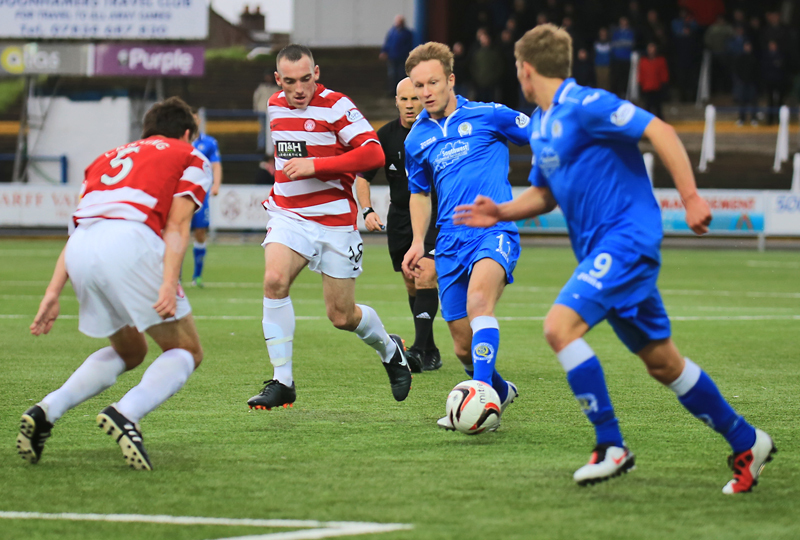 54 min Queens make Hamilton do a bit of defending as Russell nearly gets in behind. 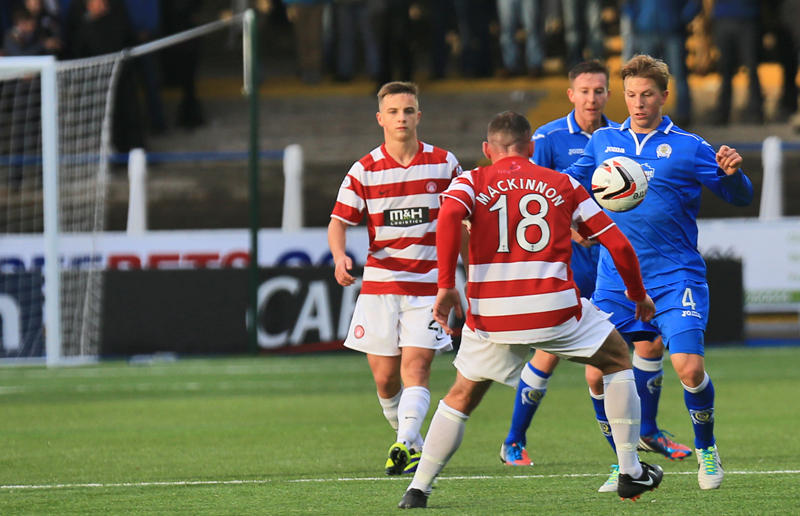 Ian McShane takes the resulting corner but Accies clear. 59 min Good save Clark. Zander Clark gets up well to push Jon McShane`s header over the crossbar following Crawford`s corner. 63 min ...Mitchell swings it in with pace and Cuthbert in the Hamilton goal has to push it over. 65 min They`ve not really deserved it but Queens lead. Mitchell sends in a corner from the right and Lyle meets it three yards out to score. 72 min Queens look like a different side since Lyle came on and they changed to a 4-4-2. Much better but Hamilton are still a threat. 77 min Hamilton have a half-chance as a corner drops to sub Longridge who spins and hits a weak shot straight at Clark. 82 min Decent effort from Hamilton sub Antoine-Curier as he holds off Mitchell`s challenge and hits a well-struck shot not too far over the bar. 84 min Michael Paton comes on to play on the left wing and Iain Russell moves up to partner Derek Lyle. 90 min Queens are seeing this game out well enough as Chris Higgins heads back to Clark. Higgins has been Queens` best player today. Outstanding. 90+2 min ... The `keeper was up but the corner missed everybody. 17:51 Queens upped their performance in the second half and just about deserved their goal. It was nervy at the end but they got there. 17:51 Same again next week?